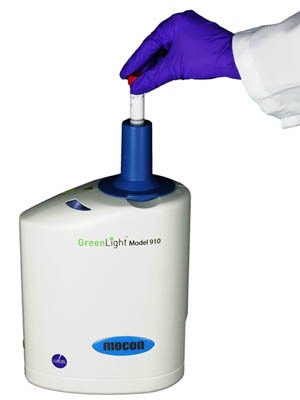 The GreenLight 910 can calculate live aerobic bacteria loads in as little as 45 minutes making it possible to perform real time operational changes to processes and automatically record results. Using the APCheck vial system, the Model 910 accommodates a 15.0ml vial in a compact package that is suitable for main water treatment plants, beaches, wastewater, field lab, or QC use. The unit and its GreenLight software require minimal training to test water samples with results that outpace the classical 24 hour enzyme substrate tests or the 24(+) hour membrane filtration test. Results are automatically recorded to meet 40 CFR part 160 “EPA” and 21 CFR part 58 “FDA” requirements.